Who is still head over heels for tassels and especially tassel earrings? Raise your hands! There is something so charming about long flirty dangly bits of cotton or silk softly brushing your shoulders. I love contrasting colours (pink & red anyone?) 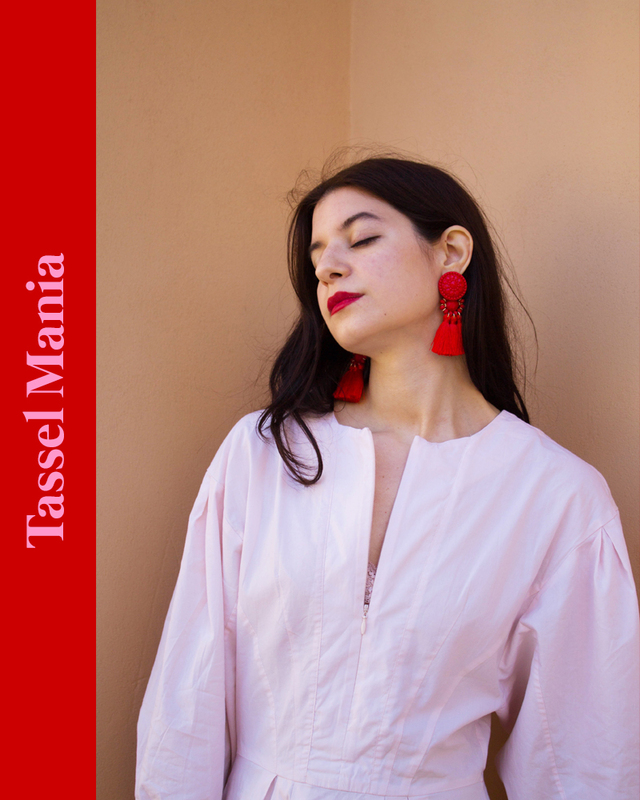 and chose to wear my H&M tassel earrings paired with my (cousin's) H&M dress that she kindly let me steal for my Majorca trip as I couldn't find it anywhere. You can see it in all its midi glory here. How good are those sleeves? The only downside of the dress is if you happen to be rained on, you better be wearing good underwear cause everything will be on show. So not really a downside if you are prepared. Which you will be cause now you know. Stay chic. Any favorite tassel earrings? Leave links in the comment's section!